Is your organisation managing requests for Leave through email? Or are you still distributing payslips? Often employees aren’t in control of what’s theirs and this creates all sorts of administrative burdens. With MyPay, not only can employees get at documents like their payslips, they can also manage specifics such as which bank account their pay goes into. 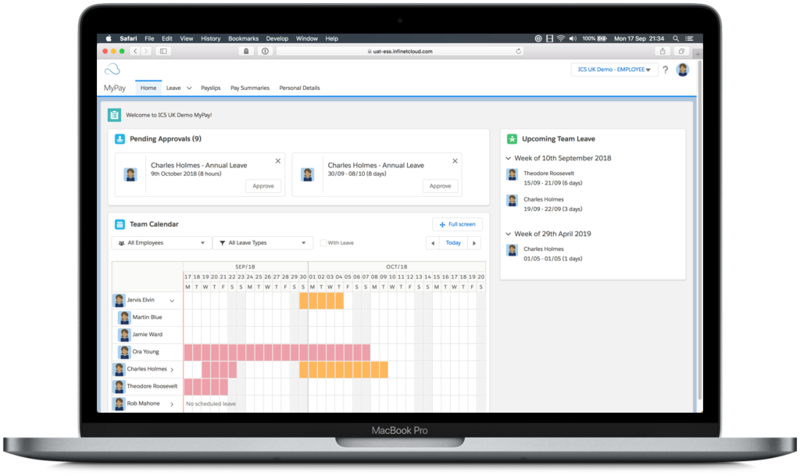 Plus with our Leave Management built-in – requesting and approving leave has never been easier, with real-time leave forecasting and nifty features like Team Calendars – everyone can be in charge. Be it a standard or custom Leave Entitlement – balances are always available and calculated real-time and respect the rules you set. At a glance, see who is on leave when. Click-through team hierarchies and get useful contextual information like public holidays. Let employees manage their personal data – be it bank accounts, addresses or simple details like phone numbers. Every payslip, available at anytime, anywhere. With tight NetSuite integration, all MyPay data is available right where you need it. This means reporting, customisations and all the advantages of the NetSuite platform are at your disposal. Data gets synchronised instantly, thus any customisations that require transitions become seamless. We chose to build MyPay upon the Heroku platform mainly for its scalability. So whether you’re starting out small or have an enterprise of employees, MyPay will work for you.